A gentleman’s presentation is his statement to the world.It is his calling card on how he is to be treated and accepted. There is no getting around it, 95% of all first impressions are non-verbal and usually occur within the first 10 seconds. We all make certain assumptions based upon initial observation which can sometimes be difficult to reverse. All the world is indeed a stage and some gents have no idea what part they want to play. 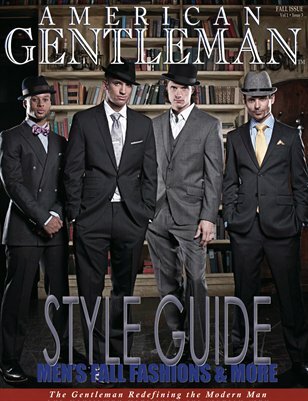 Fortunately, we at American Gentleman Magazine have taken on the role of personal stylist, agent and publicist providing all the latest trends for fall in fashion, wardrobe building, grooming and more so you can take your story to a whole new level of success! In this issue we definitely have what it takes to make you ready for your close up. Special Sample Preview Issue • Free Digital Download!